GeekTonic: Kindle for iPhone Has Arrived! You read right. The Kindle iPhone/iPod Touch app that allows your iPhone & iPod touch to read kindle books without a Kindle Reader has arrived. Since I'm just finishing up my last edits of the dual, GeekTonic Kindle2 reviews this timing is pretty good. What does the iPhone Kindle App Do? You can now shop for books, magazines and newspapers, and add them to your iPhone or iPod Touch via the Amazon Kindle Store. And then wirelessly transfer those books to your iPhone or iPod Touch. Download the Kindle books you already own for free! Huge benefit to current Kindle owners! Supports "whispersync" which allows you to seamlessly switch back and forth between your Kindle device and Kindle for iPhone and maintain bookmarks and reading location between devices. 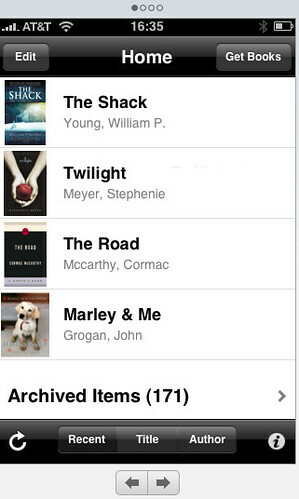 Books purchased on the iPhone can also be read on the Kindle of course. Honestly, I can't see reading an entire book on my iPod Touch. It's just not designed for such a function, but it certainly makes sense to use as a supplementary reading device to go with my Kindle 2. And I can see reading a magazine or newspaper article on the iPod Touch. UPDATE: Unfortunately, it appears the magazines and newspapers are not yet enabled on the iPhone Kindle app. Very disappointing. I'm expecting to see these sort of apps on many more devices like the iPhone soon. Great move by Amazon. Now if they would just tweak that Kindle 2 price down several notches we'd be in eBook nirvana. Since this news broke just as I was heading to bed, I rushed to try it out (of course). I installed the app, typed in my Amazon.com email and password and almost instantly saw the books I had purchased for the Kindle2 listed on the iPod screen. The newspaper was not there however so I'm not sure if that is syncing. Landscape mode does not work for reading the book - bummer. There is no shrinking and expanding the page like you can with a photo on the iPhone. You can slide a page left or right to go to the next or previous page. There is a font size in the menu so you can choose from five different font sizes for the book display. There is a "Go to" menu item that displays the following options: cover, table of contents, beginning, location (enter a book location 1-5906) and my notes & marks (notes or bookmarks just as you have on the Kindle). Overall, navigation is pretty easy and reading on that tiny screen is actually not all that bad. As I said I wouldn't use it to read for a long period of time, but it's definitely not bad in short spurts. I'll report back after a little more sleep.